I must admit I have tended to stay away from Lush stores, I found the smell emitted from them slightly overpowering. However, I like the whole concept so I braved the smell and found that once inside it was an appealing market place style shop full of enticing fresh products. I soon found myself wanting to purchase a whole lot more than I intended to and had to literally be dragged out of the store by my husband. Whilst I was there I picked up a sample of their famous Ultrabland Cleanser. I have been using this now for over a week (the sample has gone a long way) and the results are favourable. It is described as bland but effective. 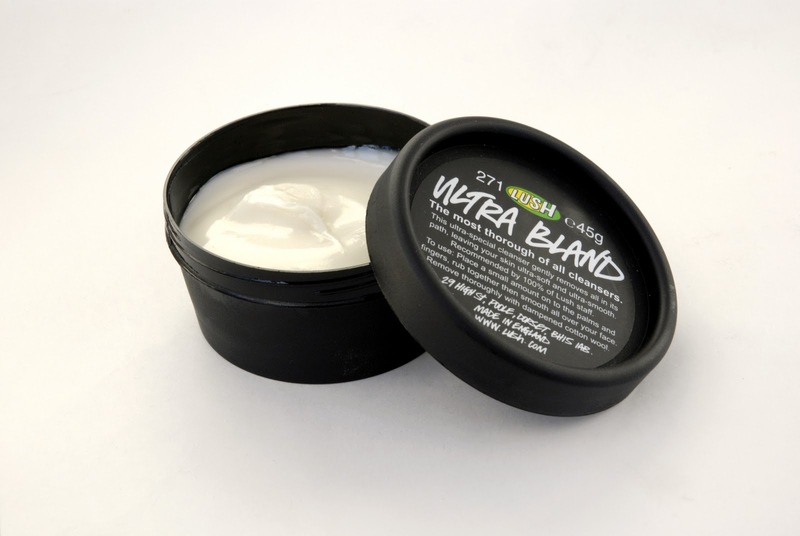 The Lush website says - "With a new almond oil base, this cream cleanser takes off make-up and cares for your face. It's gentle, but the deeply-cleansing oils reach down and remove stubborn dirt". It is thick,yellow and gloopy. I also found it to be unscented. I put a little between my fingers to soften it a little and then massaged it into my face, it left it looking like I had smeared margarine all over it, greasy and oily looking. Then I used a warm muslin cloth to remove the cleanser from my face. It is a very effective cleanser, removing some heavy make up! My skin was bright, felt very clean and soft. It leaves a waxy residue on the face (much like Pond's Cold Cream Cleanser) but if you use a toner then that residue disappears. I would definitely purchase this cleanser. I love LUSH but have for some reason not tried their cleansers - I may just give it a go now. Their Sympathy for Skin Body lotion is something that I don't think I could live without. Their solid shampoos are great in principle and fab for travelling, but I haven't found one to suit me. I also find the bars of soap drying. I'm so glad you reviewed this I will definitely give it a go now! I'm all for trying something more natural. Will you be trying a Lush moisturiser too? I too hate the lush smell. I love the ballistics though! My favourite cleanser of theirs is Baby Face. My skin is always lovely and smooth and it's cured my harsh face scrub addiction! So many things to try at Lush, thanks for all the recs!